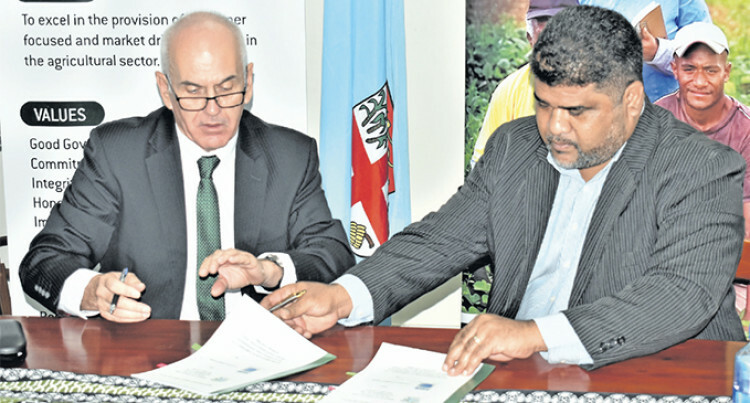 The Fiji Development Bank and the Ministry of Agricul­ture, signed a Memorandum of Understanding on a matching grant support scheme for Small and Medium enterprises yester­day. FDB chief executive officer, Mark Clough, said the scheme would pro­mote market-oriented agricultural production by farmers in remote rural areas. He added incentives provided with access to grant finance of up to $50,000 and loan funding of up to $100,000 to existing agribusiness enterprises, are prepared to invest in expanding business with small-scale farmers. Mr Clough confirmed that a num­ber of regions have been identified for the application of this scheme. Those areas include Ba, Nadroga, Navosa and the Naitasiri provinces. He added the scheme would help promote market-oriented agricul­tural production by farmers in re­mote rural areas. “They can be input suppliers, ex­porters, processors, suppliers to the tourism industry or supermarkets or traders supplying or selling in domestic urban markets,” said Mr Clough. He added that possible uses of the investment capital raised might in­clude a vehicle to enable the SME to access remote farming areas. Other infrastructure to promote improved market-oriented produc­tion, working capital or inputs support for a contract farming ven­ture would also be included in the scheme. “FDB recognises the constraints faced by SMEs in the agriculture sector in accessing finance from formal institutions to grow and di­versify their operations and how that adds to the hardships faced by small-scale producers,” he said. Mr Clough said that FDB was re­sponsive to FAPP’s proposal to col­laborate as both share the common value of improving the livelihoods of people particularly those in ru­ral and remote areas. Permanent Secretary for Agricul­ture David Kolitagane highlighted the grant will boost the ability of these SME’s to acquire products from the remote rural areas such as the highlands. “It will ensure that these disad­vantaged farmers have a secure market and will reduce the risk of loss through consistent purchase by the SME’s being supported and not having to transport their pro­duce to markets for selling,” Mr Kolitagane said. “The matching grant from the Ministry will be equivalent to 25 per cent of the total investment cost proposed by the SME. Mr Kolitagane added they were not only focused on the access to fi­nance but also providing solutions to farmers as well as exporters. “We want to see the income in­creasing, and also to the middle man are located in the interior but also accessible to those in the hotel chains,” he said. The scheme through its Fiji Ag­ricultural Partnerships Projects [FAPP] was funded by the Interna­tional Fund for Agricultural Devel­opment [IFAD]. The Ministry of Agricultures will be advertising to SMEs to apply for the scheme in due course.